Who was Kicking Bear and why was this Native Indian chief famous? Summary: Summary: Kicking Bear (c.1849–1877) was a famous chief of the Lakota Sioux tribe. He was a leading figure in the resistance to white settlement on Sioux tribal land. 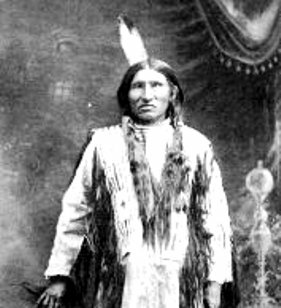 Kicking Bear fought with the Indian tribe confederation that defeated General Custer at the 1876 Battle of Little Bighorn in 1876 and was one of the famous Ghost Dancers. The following fact sheet contains interesting facts, background history and information about the life of Kicking Bear and the events in history that led to his fame as a great Native American Indian leader. Kicking Bear was born on March 18, 1846 as an Oglala Lakota Sioux. Originally, he was given the name Mato Wanartaka. His father was Black Fox who did not hold any revered position within the tribe, but Kicking Bear was made a chief during the period known as the Sioux Wars (1854 - 1891). Kicking Bear strongly opposed the white encroachment of Sioux lands and resisted against white expansion. Kicking Bear became famous for his involvement in the Ghost Dance movement. The Ghost Dance movement was revived in Nevada in the year of 1888 by two Paiute shamans, called Wodziwob and Wovoka. The Ghost Dance was part of a mystical ceremony designed to re-establish the Native Indian culture and restore the environment to pre-European levels. The dance was believed to help recover the riches the Native Americans once had with lush fields and abundant herds of bison and to rejoin the people with their ancestors. It also included the promise of the white men being swallowed up by the earth. The Ghost Dancers wore Ghost shirts, of white muslin which the Native Americans believed that no enemy weapon could pierce a Ghost shirt. Kicking Bear married Woodpecker Woman who was the daughter of Chief Big Foot in the Lakota Nation. Kicking Bear offered several horses to obtain her hand in marriage, which he was able to capture during the clashes with the Crow Native Indians. As a result of the betrothal and subsequent marriage, Kicking Bear became a respected member of the Lakota Sioux. The following Kicking Bear timeline charts the resistance of this great Sioux war chief against the encroachment of tribal lands in Dakota. 1892: He returned to his family the Pine Ridge Reservation in South Dakota.